- Business users can scope searches to "Personal Notes" or "Business Notes"
When editing a note in OSX 10.8.2 on a 2012 Macbook Air using Evernote Version 5.0.5 (400808), one of the notes I was editing suddenly and inexplicably opened up in a new window.Did I press something wrong? If so, what could it have been? No idea what that is. Is it happening often? Weird, right? Even if my chubby palms hit the trackpad area, it wouldn't produce that, so it was kind of a surprise. It only happened once. I haven't had it downloaded very long, so not many opportunities to produce it, though. I'll keep an eye on it. It happened several times on my mba 2011 with mountain lion. But it's on evernote 5.04. And evernote hang after the new window open. I forgot to report. How? I can't seem to get this to work, given that ENML is read-only. - Notes still disappear while editing. Is there any way to work around this? Why is this happening? - If I have three or four images on top of one another, with no lines in-between, then hitting a carriage return on the top one will take me down to the bottom of the note. If I drag the second image out of the column of images and put it next to another one, for example, then I can hit enter just fine. How did this (admittedly) rare use case come up? I took a bunch of screen shots and dragged them all at once into a note. You probably wouldn't notice the bug if you were only working with one image at a time. Obviously, this is a bug, and "use Chrome" is not a fix, but it is a workaround for now. I am embarrassed to say it, but I don't understand what is wrong with my searches. Just now, I searched for (intitle:listening podcasts). That should have returned a few dozen notes, but it says 9,185 -- all of my notes. OK. I press CMD+R to clear the filters (right? ), and try again. Now it says 0. This has actually been a problem for a while, but I figured it had something to do with me, and I kept putting off reporting it, because I wanted to spend some time going through all the steps. I don't think it is me after all, because I use Windows a lot, and never run into this. I can't remember one time I have gotten 0 on a search. I am calling this a broken "Clear" button, but there is just a whole lot of weird stuff going on. I have not typed a single word into the search field, but all of the stuff below is happening. I think I am just going to uninstall and try again, because something terrible is happening, and I have to move on with my work! I'll use my Windows install to upload everything in a second, and I'll post a link to the screenshots. 1. As others have noted: links pasted from Safari are still not activating and remain plain text. 2. As I, and others, have noted several times with earlier versions of EN 5: individual tags are not highlighted in the sidebar when selected. PLEASE can you fix this? 3. Command-clicking multiple tags in the sidebar results in a blank note pane for me. No notes show up. Yes, thanks - it works in Chrome for me too! 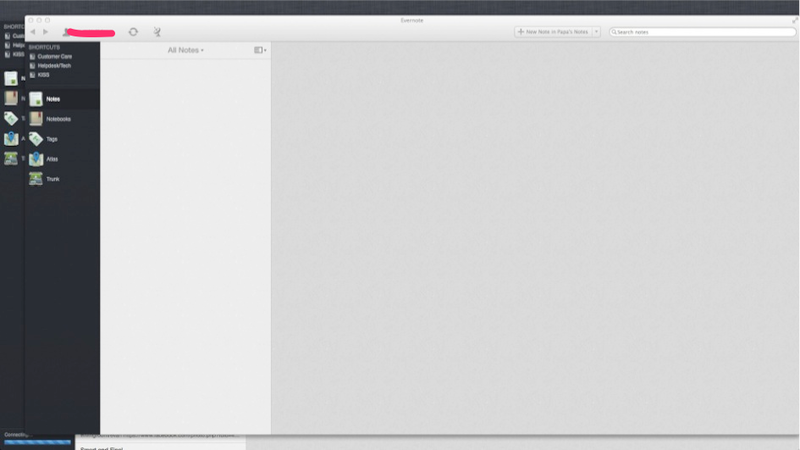 Need to get FF and Safari working - very strange as it wasn't an issue in previous versions of Evernote. @GM, I'm not able to reproduce any searching-related issues like that. Also, what is CMD-R? @trumpet, links are getting looked at again. If you cmd-click several tags and no notes show up, it means that no notes are tagged with those two tags. I hope I won't be able to reproduce those problems either! However, I have seen some before, so I will probably see them again. As you can see in the screenshots, there is clearly something going wrong -- nothing in the search field, but my notes being filtered. As for Command + R, isn't this the command to clear the search? If not, then I am deeply confused! Well, my initial sync will be finishing soon -- my notes are all downloaded and processing, so I should be up and running again on the Mac this afternoon. Disappearing notes again. I am getting the correct results, and then 0 notes again while editing notes. I must admit that I am ignorant about the meaning of "processing," so that might be affecting things, but this is basically the same pattern I have seen before, when it was finished processing. [EDIT:] See the screenshot at the bottom. If you cmd-click several tags and no notes show up, it means that no notes are tagged with those two tags. So you're saying that there is an implied "and" when multiple tags are selected, not an implied "or". To satisfy a search where TagA and TagB are selected, the note must have BOTH TagA and TagB. Disappearing bug again (I'd say this is the tenth time or so today I've lost a not while editing). So, here is my activity log from the minute that it happened. Does this "2013-01-25 15:19:57 [ENRelatedNotesOperation] INFO: -[ENRelatedNotesOperation main]: note with ID ((null)) seems to have gone away" mean anything? Hi. I just updated to the newest version and now I can no longer drag PDFs into Evernote. All I get is the little "Processing" slider at the bottom and it doesn't move. UPDATE: It is working but the processing is very very slow. Took over 5 minutes to import a 1-page PDF. There is my disappearing note bug again, and I noticed this in the Activity Log right when it disappeared. Is it the related notes feature doing this to me? Again. This time I was changing the title of one note, and that's when everything disappeared. OK. I think I have narrowed it down to one particular action that will reliably produce the error. If I have the intitle search filter on, and I change titles, then everything will disappear at some point, and I will end up with a blank screen. It may not happen the first time, or the tenth time, but it will definitely happen. The re-indexing goes OK, but after that, the error occurs (I am watching the Activity Log while this happens), and the related notes message will pop up. Given that I did not have this error before the related notes feature, I have never encountered it on Windows, and the message comes in tandem with the error, I am going to guess that when it searches for related notes, it doesn't have the note title data to work with, and this throws the error. By the way, I haven't changed anything in the title that would make the note fail to meet the criteria. It is just throwing the error every time with any change. I have recorded the error along with the Activity Log. This is not the only situation when the error occurs -- it happens quite often when I am editing the note content -- but this is the error I could consistently reproduce and get recorded. Make sure to scroll to the bottom of the note for the movie. Beta testers have two copies, the release version and beta version. General release users have one copy, the beta version. Why, after all of these years, do I click that damn update button before reading the posts? Did you mean to say that the note links are broken? Or, by retrospective, did you mean to say that they were not working in the past? Mine are working OK. I get the underlined hyperlink when I use "Copy Note Link" and paste it into a note (Snippet view, by the way). It seems to be working fine for me. Is it not working for you? In OSX 10.8.2 on a 2012 Macbook Air using Evernote Version 5.0.5 Beta (400788), the client says I am syncing, but the sync icon is not moving, and the sync status says no activity. Searches do not work, but I can open notes and edit them, or make new ones. Clicking the share URL for this note seems to have made the sync start, but the sync icon at the top never moved. See video below. Interestingly, I seem to have lost the ability to make any rich text changes to notes while Evernote is in this state. The bar is gone, so I cannot change fonts or anything else. Forcing Evernote to quit and restarting seems to have solved the problem. Still happily using v3.3 and just moved my other team members back to v3.3 as well. Looks like it may take a few more months to get v5 stabilized, then another six months to get back the features that were removed; all just to get a new graphics design? Monkey - are you on the EN payroll, or just very generous with your time? I ought to be on the payroll, right But, I am not. Seriously, though, I spend so much time here because I am kind of a notetaking nut, and I've found Evernote to be one of the best all-around services that I have ever used for my notes, so I want to help others get the most out of it, and (more selfishly) make the case for features that I want to see developers change or introduce. I second this request, how do we get this to work? I am appalled at the number of major bugs that Evernote continues to allow with each new release/update. There was a time, over a year ago, that we all welcomed new releases, and updated quickly with confidence. Do NOT make an update unless I have a compelling reason to do so, and there are no bugs reported that impact my workflow. The only major bug I have encountered was data loss, and that was in an earlier release ( ). That was pretty distressing, but I am happy to say that I was able to retrieve my data. This particular release doesn't seem to have any "major" bugs, though plenty of irritating ones (I regularly lose focus on a note -- maybe once an hour or so). If you are looking for a compelling reason to update (I don't know what version you are running now), I'd definitely recommend the related notes feature. I'm quite pleased with it. Today I found a bug in shortcut sync. The sync works well between two Macs until I switch to a second account and back. The shortcuts go back to their state before sync. After disabling sync, proceeding a sync, enable sync and proceeding another sync shortcuts are in the right state. I can do this several times with the same effect. Every time I switch to the second account, I lose the shortcut sync for the first account. I completely agree. This is six releases and it's not yet as stable as the version that it "upgraded". Fortunately the server side technology is solid (or so it seems) and v3.3 is also very stable. This is six releases and it's not yet as stable as the version that it "upgraded". Was there a change in engineering management at EN or a mass departure of engineers? Something went horribly wrong with v5 for the Mac. I'm guessing it was a total rewrite so for all practical purposes it was v1.0. Features were removedand it was overall destabilized. To address your concerns briefly: Mac v5 wasn't a rewrite. It was built on top of the existing codebase and it repaired a staggering number of issues. Our engineering team is larger than it was by a year ago and we haven't had any turnover (no weird knowledge transfer issues). Finally, our support requests are down, along with are our sync errors and crash reports. 5.0.5 is by far our most stable release. Jack, maybe you weren't around over a year ago. Back in those days the releases in ALL Evernote clients (Mac, Win), were much more stable and had far fewer bugs. I first noticed the increasing number of major bugs in each new release starting somewhere around March 2012. Please prove me wrong. Just post the number of bugs reported for each release starting June 2011. What I can say is that the Mac team has been working tirelessly to resolve stability/performance issues and give our users the best possible experience. Not sure what you mean about "raw number of crashes or bugs", but the number of logged, reproducable, confirmed bugs for each release would speak volumes. If you guys are not looking at this statistic, you are missing the boat, IMO. As I'm sure I've made clear in the past, I'm not interested in being an EN tester. I'm waiting for "stable", not "most stable". But for the sake of discussion and giving you a fair listen, what does EN feel are the compelling new features of v5.05 over v3.3 that would make me put my data and time at risk? I've read the product announcement and used v5.0 long enough to form my own opinion, but what do you feel are the few knock out features that make risking data loss a good trade off? All except for Evernote I'm afraid which has proven to be a real drama. With nearly 9000 notes in my Account, my DB is now over 5GB's in size!!. Trying to reinstall took all day, required the full time attention of my processor and after 2 x attempts I gave up. I also tried the web client, but this seems unusually slow and barely usable?? Have you guys discussed/explored the idea of "Offline Notebooks" on the Mac Client? I looked through the forums and cant see any reference to it...other than iOS of course. I many respects, Evernote on the Mac is NOT a Cloud tool and like the AppleMail client has become a bit of a behemoth. While many users are demanding more and more features,... personally and as someone who has used Evernote from the early days, I think less is more. Clever HD for example on iOS is fabulous and a snappy example of how Evernote should work as a client from a speed perspective. Pocket on the Mac by comparison (and I have a massive library in here as well) reloads from scratch in no time. The web client is brilliant. I love Evernote and it is now a major part of my working life as you can see for the number of documents I have in my account. In many respects it is now my "Finder". But I have to be honest, ... Ive struggled for the data management side of things of late. Hi. I've written repeatedly on these forums pleading for offline notebooks on the Mac. You haven't seen my eloquent writings on the topic? At one point, my Evernote database became so large that I had to remove all but a handful of my attachments (http://discussion.evernote.com/topic/29245-how-to-optimize-your-evernote-experience/#entry173506), and reduce my database to a relatively "small" 5 GB. As for Evernote, have you tried the direct download from Evernote instead of the appstore one? Thanks for the reply. Nice to know I am not alone. I don't think you ought to be having any problems with the reinstall. Have you tried the link I suggested? If that doesn't work, then I hope you'll consider a support ticket (see my signature below), because that would be a serious problem about which the developers should be told. Boatguy, it's completely up to you when you decide to upgrade. Onthewire and GM, selective sync in desktop clients are somewhat of an inevitability. However, there are a host of usability issues that have made this impossible in the past and will continue to hinder progress in the near-term future. For example, searching across all your personal, shared, and business notebooks is not possible in any mobile or web (selective syncing) client (Clever included... great product btw). However, as more users' databases grow in size, the situation will become more important to solve. Just know that you're not alone in this issue, we Evernote employees are in this boat too, and are looking for the best way to help Evernote manage users' information as their libraries grow. - I don't know why, but it ended up in the Trash. As far as I know, I did not press anything. I spent a lot of time looking for it, and thought it had been lost (not the content, mind you, but the entire note). This would have been a first for me. After searching through the Activity Logs, I found it in the Trash. Why? - The Clear button is not working again. Here is a video along with my activity log. - I don't know how to reproduce this, but the first step is a search to filter notes. Then, the Clear button stops working. I try another search, and the same thing happens. If I click on Notes and then do the search again, the Clear button will start functioning again. - How can I avoid this? CMD + R doesn't seem to help. Surely, this isn't expected behavior. I just want to get back to my notes and do another search. Is there a keyboard shortcut I am missing for this? Thanks for the reports GM. Definitely in the queue. Have you tried going back to v3.3? You can find it on the web, or email me from the link on my web site (www.newmorning.info) and I'll send you a copy. I've removed v5 on several Macs with AppDelete, then reinstalled v3.3 with no problems. Certainly it will take awhile to download 5GB, but if it worked before in v3.3, it should work again. Thanks for that and thanks GM for the link to the direct DL. However as a SW designer/architect myself, one has to think that you guys are approaching this the wrong way. While you seem to been inundated with an endless steam of "feature requests" of which I've been guilty of myself, whats needed here is an "Evernote Viewer" app., possibly a Control Bar evoked tool similar to say Smally, which is an interesting idea if you haven't seen it? Still needs some work, but shows promise. with advent of SSD's, disk space is also becoming a premium, many MacBook Air users such as myself for example, have only 60GB versions (by design) with less usuable space than an iPad. Having to manage therefore 5 or 6GB of local data for 1 x App is simply untenable, iCloud solved this for iTunes of course. Ive also been very impressed with Pocket's Mac client which whilst minalistic in terms of features, is fast and quick to load, first sync etc. This is what I think is needed for Evernote in the form of a Companion Viewer app. That's another reason why we also need a more powerful and feature rich iPad app. The retina iPad 128GB is being released next week for half the price of an 11" 128GB MacBook Air. Clever is a great "viewing app" but doesn't have offline notebooks. And, of course, no desktop version. When I attempt to load Evernote now from the recent update this is all I get. I have done a restart, uninstall/reinstall, and still nothing works. I even left it for an hour with no change. Any ideas why this happens on Mac 10.8? The 128GB iPAd is $800. The 11" MBA is $1100. How is that half? Naturally, I agree with you about the need for a better iPad app, but to be honest, I actually don't yearn for so many more features. Don't get me wrong, I wouldn't complain if it could do X,Y, and Z, but I'd rather see it do X really well. The iPad simply doesn't have the OS or specs to handle too many features. It would be better if they target some of the key ones. OK, so I exaggerated a bit but what I meant was the principle that the iPad is becoming a more compelling alternative and I therefore find it hard to understand why the iPad version is still the weakest of all EN versions. I know of course that due to OS limitations it can never be as feature rich as the desktop versions. Adding too many features may even be counter productive if it slowed the app down too much, but there seems no good reason why its functionality shouldn't be at least a bit closer to the Android version. For example, why are there so few sort options and why is the search box so small in EN 5? It seems more cumbersome than it needs to be. True. There are too few sort options in Apple stuff -- far fewer in OSX than Windows, and on iOS we were down to just two at one point. I think there is just not a priority on these features, and perhaps if you could make a case for them, then you could persuade the developers. To be honest, I don't think we should have to make a case for something as basic as sort options that are available in the nearest comparable client. I guess I just don't understand why the Apple teams feel we don't need them and the Windows team feels we do. At least up to now, Windows still being version 4.x.x. I guess I just don't understand why the Apple teams feel we don't need many sort options and the Windows team feels we do. At least up to now, Windows still being version 4.x.x. Anyhow, the teams are different, so design objectives / philosophies are too. Somehow (for whatever reason) the Windows developers seem to "get" my workflow, and even the location / method of changing sorts is just right. For other people, though, the Mac one is preferable. I won't say which one is better, because that is subjective, but I sure wish I could convince the developers to err on the side of more rather than fewer features, especially with crucial things like search and sort. Going by these forums at least I don't think you're the only Mac/Apple user who wishes for more of these crucial things. "Tags from Joined Notebooks now appear correctly"
as "one of the other improvements"
Can somebody comment on whether this change was actually deliberate? And whether we can expect it on IOS? Which is great. But if searches can be scoped that way, and the 'all notes' list can be scoped to '"My Notes", why does the tag list continue to include now irrelevant shared tags? I noticed "fixes to Saved Searches" and thought I'd give 5.0.5 a try, assuming a scrollbar was put in place. No scrollbar for Saved Searches, still?! Luckily I saved 3.0.3, I'm going right back. See you guys around version 7 or so. Ditto. And the comments on 5.06beta don't look encouraging either.